A direct descendant of the original Fisher Paragon with the benefit of 17 years of refinement. Solid, sure-footed and built for the long haul. I didn’t know at the time it was named after Lars Zebroski as @gary_fisher tweeted this morning. It reminded me of [Dungeon and Dragons](http://en.wikipedia.org/wiki/Character_class_(Dungeons_&_Dragons#Paragon_paths_and_epic_destinies). The Tange prestige set the standard for how I think frames should feel and ride, including urban, cargo, and folding. The top-mounted Deore XT shifted in all conditions with solid, responsive feedback. Have an issue with the indexing during an epic ride across the Eastern Washington desert? Then toggle it to friction mode and continue shifting. When I added a Manitou elastomer fork to the Paragon, I rode more single track and bounced through bigger hits. I also learned the limit of fork travel when it would bottom out and throw the rider in a crash known as an endo. A later endo ended racing mountain for me and I turned my attention to learning everything I could about the road. I got schooled in the legends of Paris-Roubaix, pacelines, embrocations, and riding in the wind. What was your first race bike? The first “real bike.” The one that made you go fast. 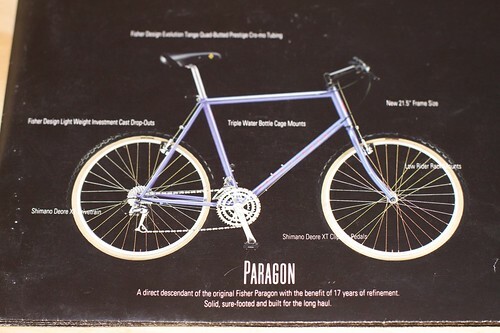 The Paragon name is now on a hardtail 29er, a style of bike I have not yet ridden. Next Next post: Cyclist Are Hot!